The AAA Four Diamond Award-winning Harrah's New Orleans hotel is located in the heart of the world's most exhilarating city. This 26-story marvel, with 450 oversized rooms and suites, provides an unparalleled escape. These luxurious New Orleans accommodations feature deluxe beds with pillow-top mattresses, flat screen televisions and wireless Internet. With spectacular views of the Mississippi River and New Orleans skyline, just steps from the French Quarter and Convention Center and a few blocks from the Superdome. 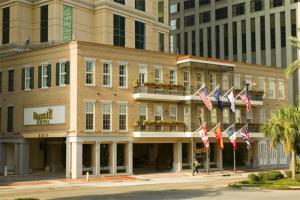 Located in downtown New Orleans, just 4 blocks away from the French Quarter and the Convention Center. French Quarter, Convention Center, Superdome, Fulton Alley, Audubon Insectarium, Jackson Square, St. Louis Cathedral, Longue Vue House & Gardens, Louisiana Children's Museum, New Orleans Museum Of Art.